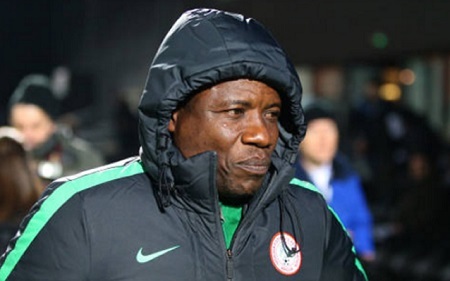 The Nigeria Football Federation on Wednesday said it had banned Super Eagles coach Salisu Yusuf for 12 months and fined him $5,000 (4,300 euros) for receiving cash from undercover journalists posing as agents. The NFF ethics and fair play committee found Yusuf guilty of accepting $1,000 after he was caught on camera being asked to select two players for the 2018 African Nations Championship (CHAN). “He is hereby banned for the period of one year, from partaking or involvement or participation in any football-related activity, effective from the date of this decision,” the NFF said. Yusuf, who denied any wrongdoing, has the option to appeal. The BBC, which aired the footage, said the report was part of a wider investigation into corruption in African football by the Ghanaian journalist Anas Aremeyaw Anas. His expose led to the resignation of the head of the Ghana Football Association, Kwesi Nyantakyi, after he was accused of soliciting bribes and kickbacks. Yusuf said in response to the BBC in July that the sum was $750, not $1,000, and was a “gift of trivial and symbolic value”, that was acceptable within NFF and FIFA guidelines. But the committee said Yusuf’s actions had “a damaging effect on the reputation and integrity of Nigerian football”. It added that “he ought to have conducted himself more professionally… as his conduct in public and in secret should be exemplary, since coaches are role models”. Yusuf, who previously coached Enyimba and Kano Pillars, helped senior men’s team coach Gernot Rohr steer the Super Eagles to this year’s World Cup in Russia.